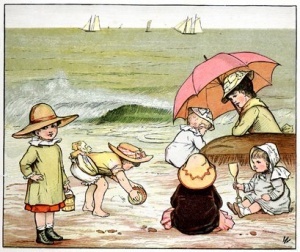 Five young children play at the beach while their mother sits nearby shading herself under a pink umbrella. Several sailboats glide by offshore. Universal Access: Disability, Technology, and Society, taught by Computer Engineering Professor Roberto Manduchi, is an overview of human-centered technology and its potential for increasing the quality of life and independence of disabled individuals. Students in the course learn about the physical, psychological and psychosocial aspects of disability. A class project helps students understand the challenges of being disabled, and teaches them that they can make a difference for those with disabilities: in this case for children with print disabilities. These children may have a visual impairment, such as blindness or low vision, a severe physical disability or a learning disability that impacts their ability to access traditional print books. To the complete the project, each student selects a children’s book from a list of available titles, and must describe every graphic figure that appears in the book. The description, in textual form, is uploaded online through the Poet Image Description Tool, an open-source tool for adding image descriptions to digital books. The books assigned to UC Santa Cruz students include many well known stories, for example, Curious George and The Princess and the Pea, as well as stories related to science and (of course) engineering: The Boy Who Drew Birds: A Story of John James Audubon and Robots, Robots Everywhere, among many others. The class project was made possible through a partnership with Bookshare, an online accessible library for people with print disabilities. Bookshare® is part of a Global Literacy initiative of Benetech, a Silicon Valley-based nonprofit technology company. “Our partnership with UC Santa Cruz this year will help us build our collection of children’s picture books that are fully described to close to 300 books!” – Kristina Cohen, Senior Manager of Benetech’s Global Literacy Program. The Baskin School of Engineering specializes in education and research across seven departments: applied mathematics and statistics, biomolecular engineering, computational media, computer engineering, computer science, electrical engineering and technology management. Developed by The Diagram Center, a Benetech Global Literacy Initiative, the Poet image description tool is an open-source, web-based tool for creating and providing guidelines to writing image descriptions for images in existing DAISY and EPUB books.